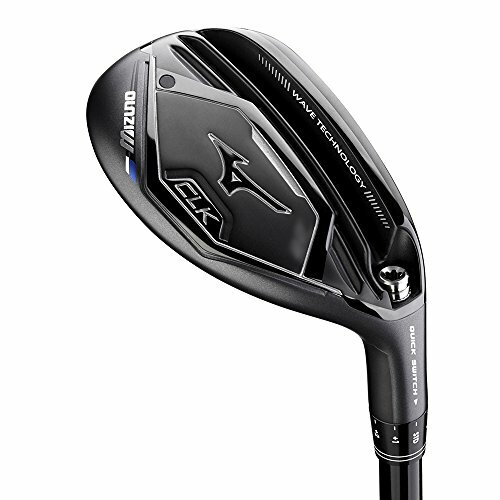 Mizuno has been making some serious waves in the last couple of years with the launch of the JPX900 series of clubs followed up by the MP-18 range of irons and the ST-180 and GT-180 woods. Along with all of this fantastic equipment the brand has also produced a new hybrid with a name that harks back to the days of hickory golf. The CLK hybrid takes its name from the original cleek driving irons many decades ago. The last time Mizuno used this name was in the MP CLK hybrid in 2010 with the MP moniker continuing as the brand’s better player’s irons. The new CLK no longer carries the MP moniker as it is suited to all golfers looking to replace hard to hit traditional long irons, and its 16-degree version makes a useful fairway wood replacement too. This is a true long iron replacement as the brand intended it to be. The colour of the crown, the sound at impact and the flight these clubs produce make it easy to put in your bag in place of your 3, 4 and 5-irons. And for those who battle to hit fairway woods, the 2 model (16 degrees) is a great option too, considering the shorter shaft and the way it launches the ball so easily into the air. The adjustability makes it easy to maintain the correct gaps in your lofts and to tune in the correct yardages that you require while the ability to adjust the lie angle ensures the club sits as square as possible for your height, or can induce a slight draw bias should you need it. The grey crown gives the club more of an iron look at address. The higher lofted models features more compact clubheads to closer resemble a chunky long iron. The high quality face material launches the ball high with great ballspeed and much more consistency on mishits than a traditional long iron. The adjustability in the hosel means you can precisely tune your yardage gaps and lie angle to produce much more consistency. The sound at impact is much closer to an iron than a wood, which can be quite disconcerting when you see a more chunky clubhead in front of you and expect a higher pitched sound. This is quite an expensive hybrid, especially considering it is designed to replace long irons in your set. 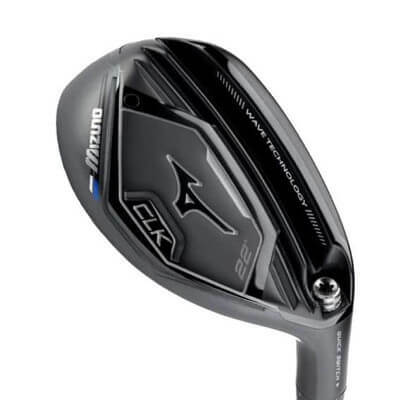 If there is one thing we know about Mizuno it is that the brand produces clubs using high quality materials and premium processes, and with the CLK hybrid it is no different. The face insert is made from an ultra-thin and durable 1770 Maraging steel that produces a much higher ballspeed at impact across the entire face area. It is particularly effective in hybrids due to how thin you can make it without compromising its integrity. The sole features the Amplified Wave Technology that was featured in the previous JPX900 hybrid, but has been updated in line with the design on the ST180 and GT180 woods. This improved version sees a much larger slot in the sole that is closer to the face and extends further along the heel to toe length of the clubhead. This brings the CG closer to the face and results in a higher launch and lower spin that enables the added workability that you would get in a long iron. The adjustable hosel sleeve is the same found in the previous generation hybrid and allows for loft adjustment of up to 2 degrees up or down and 1 degree of lie angle adjustment up or down too. Lastly, the stock shaft is a premium aftermarket shaft that is designed to keep the spin low while being stout enough to give you maximum control of your shots. As mentioned before the CLK is designed to be a long iron replacement club and not so much a fairway wood replacement. With this in mind you would be looking for something that launches high with low spin and a hint of workability. But you would want the added forgiveness and consistency that a hybrid will produce when compared to a long iron. And the CLK produces this in bucket loads. It certainly sends the ball into the air at an alarming rate and despite having lower spin still launches the ball high with it landing relatively softly for when you attack a green from further out. The combination of the adjustability and the stock shaft gives you plenty of control and confidence that you can shape the ball if necessary. And the enlarged slot in the sole ensures strikes near the bottom of the face still maintain a high ballspeed and launch with less of that harsh ‘teethed’ feel. The grey crown is definitely less distracting than the bright blue found on the previous JPX900 hybrid. This grey also merges better into your set with your irons. The black finish on the face extends up onto the crown slightly to provide a straight line across the clubhead for improved alignment. It also mimics the topline of an iron to a certain extent. The size of the clubhead increases as the loft gets lower, which is often the opposite for hybrids that are designed to replace irons, as the larger clubhead increases launch by pushing the CG away from the face. However, with the CLK hybrids the intention is to have the lower lofted clubs launch higher for added carry and forgiveness hence why the clubhead size decreases as the loft increases. The 16-degree model might seem strange to better players as the large clubhead doesn’t resemble a fairway wood and the launch produced is quite high. But for a higher handicapper who battles with a fairway wood this club, with its shorter shaft and added workability, is a great wood replacement. The CLK does fall near the higher end of the price scale and when replacing more than one long iron in your set with these clubs it is quite a chunk of change. But in all honesty these clubs perform so well that you would probably hold onto them for many years as go-to clubs that remain in the bag even when you upgrade your irons and woods.